Passed away October 28, 2018 at the Charles S. Curtis Memorial Hospital at the age of 92 years. 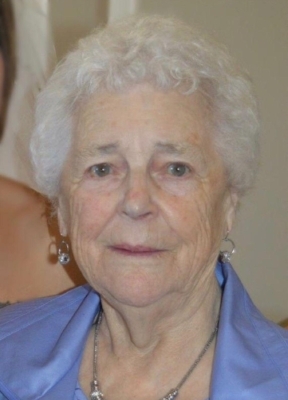 She leaves to mourn with a lifetime of memories, her Brother Bill; Children, Annie (Lloyd), Aubrey (Judy), May (Reg), Jean (Bruce), Roger (Audrey), Marie (Tony), Sharron (John), Yvonne (Ed), Renee (Neil), and Randy; 24 grandchildren; 29 greatgrandchildren; 2 great-greatgrandchildren; as well as a large circle of family and friends. Mrs. Cull is predeceased by her husband, Freeman Cull; Son, Calvin Cull; Parents, Jessie and Aubrey Saunders; and ten of her siblings. Visitation was held from Kerry M. Fillatre’s Funeral Home in St. Anthony. The funeral took place from St. Mary’s Anglican Church in St. Anthony on Thursday, November 1, 2018 at 2:00 pm with Rev. Katie Taylor-Flynn officiating. Interment followed. Funeral arrangements entrusted to Kerry M. Fillatre’s Funeral Home, St. Anthony and Roddickton, Lee Nippard Funeral Director.